With accident injuries, the injured person can take longer to develop symptoms related to their injury. This is true for adults and children alike. The difference with children is that they cannot always explain their problems. Between the years 2010 and 2014, 2,885 children died in car accident in the United States. That is about 11 children a week. While this figure is high, the number of accident injuries in children is much higher. If you are a parent and your child has been injured in a car accident, you must be diligent in watching your children for emerging symptoms. The symptoms often present differently in children. Accident injuries leave everyone scattered and overwhelmed. Your child could be confused about what happened, or may even be in shock. He or she may not be able to describe how they feel or where they feel pain. As the parent (or one standing in for the parent), you must remain calm for both your sakes. The more anxious you are, the less able you are to support your child after accident injuries. This lowers your child’s ability to remain calm. Shock is a condition caused by injury or sudden fright. Your child may or may not be physically injured. Your child doesn’t need immediate medical attention for shock alone. Though, he or she does need comfort and reassurance that the worst part is over. When a child goes into shock, his or her skin looks pale or feels clammy. She may have either a weak or rapid pulse and dizziness. She may not be able to respond to you even while conscious. You may have accident injuries as well. And, you may not know the severity of your injuries or your child’s until you get to the hospital. Get to an emergency room as quickly as possible. 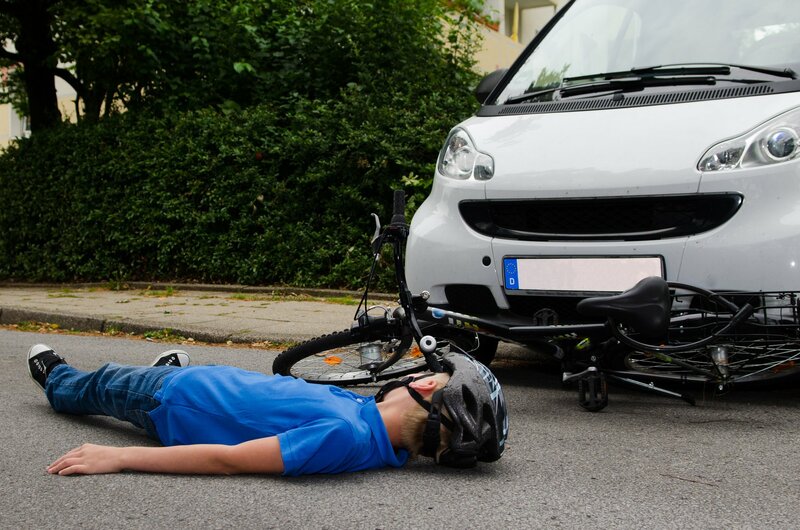 Your child’s accident injuries may be severe. Internal injuries will not be visible. Do not remove your child from the vehicle unless they are in danger. Or, you may have to remove the child if you need to perform CPR. If your child has difficulty wiggling his or her toes, legs, or arm, there could be a spinal cord injury. Moving your child, in this case, would cause additional neck or back injuries. Stay put if you can until first responders arrive. The most common accident injuries among children in car crashes are head injuries. Head injuries can be contusions, concussions, skull fractures, and lacerations. Note that children are often injured outside of the car. Such instances are called back-over accidents. They occur in driveways and parking lots when drivers do not see that there’s a child nearby. Other common injuries are thoracic, meaning lung injuries or rib fractures. Abdominal injuries occur when there are upper or lower perforations of the bowel. Fractures of the upper body involve the radius, ulna, and humerus. Fractures to the lower body include the foot, pelvis, and leg. Finally, internal injuries to abdominal organs like the spleen and liver often occur. Head injuries are especially damaging for children. A head injury can be fatal of course. When it’s not, it can still lead to memory loss and learning disabilities among other things. Some of the signs of a head injury appear right away. Others do not. If you observe any of these behaviors in the days and weeks following the accident, contact your pediatrician. Symptoms include periods of unconsciousness and abnormal breathing. They also include bleeding from the mount and nose. A head injury can also affect your child’s speech and sight. If you notice abnormal speech, report to your pediatrician. Do the same if your child complains of blurred or double vision. Finally, a lack of physical strength is an indicator that your child has sustained a head injury. Head injuries can be difficult to diagnose and treat. It can take weeks, months, or even years to see what the neurological deficits are. In healthy children, some frontal lobe functions don’t develop until the child’s teen years. These functions include higher reasoning as well as interpersonal, or social skills. If the injury happened when the child is young, the brain damage might not show itself until the child reaches middle or high school. Even though a concussion is a serious injury, it is harder to identify than outward injuries like a cut or broken bone. In the days after the accident, you may notice changes in your child’s behavior. Those are signs that your child may have sustained a concussion during the accident. Some symptoms of a concussion are frequent crying, changes in mood, sleepiness, or lack of interest in regular activities. Your child may also show a regression of motor or verbal skills. Depending on the age and development of your children, some of these symptoms may be hard to spot. A toddler normally shows sleepiness around naptime, for example. As the parent, you must fall back on your instincts to recognize when your child’s behavior is out of the norm. In these cases, follow your gut and follow up as a precaution. A fracture is another term or broken bone. The most serious bone fractures in children are accident injuries from car crashes. Treating a broken bone in a child differs from treating one in an adult because your child’s bones are still flexible and have a thicker covering. They are better able to absorb shock. This lowers the chances that they will need surgery to set and repair a broken bone. At the accident scene, first responders will use a splint to help keep your child’s limb steady until you can get to the ER or doctor’s office. From there, your child will have x-rays to confirm the type and severity of the fracture. A minor fracture requires a cast. A doctor will realign the bone when the fracture is severe. Your child will be under anesthesia for the procedure. Not all accident injuries are physical. A serious car accident is enough to rattle any adult let alone a child. Accidents are unfamiliar and frightening experiences, to say the least. In fact, it may be the first time your child ever experiences the fear that comes from being truly in danger. While there are ways you can help a child recover from the psychological trauma of an accident, some children develop Post Traumatic Stress Disorder (PTSD). At this point, they need professional help to overcome their anxiety. Children experience psychological trauma as well as physical during a car accident. They have accident injuries but also see people they love injured as well, whether it’s their parents, siblings, or another caregiver. Seeing their parents hurt triggers fear and insecurity. Children love their parents, but they also depend on them for survival. An accident threatens their survival on more than one level. The child’s world is turned inside out. He or she will need your help to recover. While you know your child better than anyone, professionals warn parents not to assume your child doesn’t understand the effects of the accident. Listen to any concerns, questions, or complaints that your child has about the accident. No matter their level of language, sometimes starting small leads to big conversations later. This can make all the difference in recovering from the accident. Most children recover from an accident with the help and support of their family; some do not. Some children develop PTSD as an aftereffect of the car accident. As the parent or guardian, look for behaviors that show you’re your child isn’t recovering as from the trauma of the accident. They may have PTSD. Symptoms vary depending on the age of the child. They also vary according to how much time has passed since the car accident. PTSD does not develop immediately. Sometimes, the symptoms don’t appear until weeks or months later. Children who have PTSD relive or re-experience the accident. They try to avoid any reminders from e accident. They become anxious and are easily upset. They appear jumpy and irritable. Younger children may revert to more babyish or infantile behaviors. These are behaviors like thumb sucking, bedwetting, or having tantrums. Children need guidance to help them through to recovery. Older children may experience depression, nightmares, headache, and behavior issue at home and school. They may experience flashbacks of the accident. They may become terrified of riding in a car. Your child may become more emotionally attached to you to the point of concern. School-aged children often feel as though their accident injuries are somehow their fault. They tend to use their imaginations to fill in the parts of the event or resulting injury that they don’t understand. A teenage child will attempt to hide their emotions. They want to appear more “grown-up” to mask their feelings from family and friends. They are often self-conscious about the possibility of not fitting in among their friends. While these behaviors are concerning, tell your child that it’s normal after a scary thing like a car accident. Encourage him or her to get back to the normal routine, or at least as much as possible if there is a physical injury to contend with. Though, know that PTSD is a condition best overcome by therapy. In the days and weeks after the accident, your family needs time to adjust. After that, if you feel your child needs some extra help to cope, then reach out. Address your concerns with your pediatrician. There are therapies specifically for children to help them overcome PTSD. Therapy for PTSD can be expensive. If your child needs extensive therapy due to a trauma suffered during a car accident, but the responsible party isn’t paying, then you may want to get legal help. The key is to prove liability. Often, a personal injury attorney is your best option for doing just that. You can sue for personal injury damages when the other party was at fault for the accidents that caused your child’s injury. Though, you remain responsible for your child’s safety while in your vehicle. Most state laws require that children under eight be secured in a child seat or a booster seat. Despite this, 43% of the children who died in automobile accidents were not properly restrained. Additional guidelines state that children should sit in the back seat until they are 12 years old. Keep your younger children in a rear-facing car seat until they outgrow them. Use a booster seat only when there is a shoulder belt in the back seat. If you don’t follow these guidelines, you automatically share some fault in the accident. You may have a more difficult time proving that you deserve the compensation you are asking for. It can become expensive to pay for all your’ child’s needed medical and counseling treatments after accident injuries. Each state has a statute of limitations for filing personal injury lawsuits. Typically, the deadline is usually one year of the accident. Sometimes the severity of the case isn’t revealed until later. In that event, the countdown begins upon the date of diagnosis. Your child’s medical and emotional needs are your priority. Though, accident injuries often cause extensive treatment and even lifelong medical expenses. If another party was at fault for the accident, you might want to at least consult with an attorney who specializes in accident injuries. If you are entitled to recover damages, that could go a long way towards paying for your child’s medical expenses.